In our quest to achieve this goal, we wrestled with what to do with our used air filter waste. Read how Reitmeier tackled this challenge, and how this initiative is paving the way toward a better tomorrow. Air filters are in every HVAC unit to clean the air being delivered to building interiors. National studies commissioned by the Department of Energy have revealed that heating, ventilation and air conditioning (HVAC) systems can consume up to 34 percent of a commercial office building’s energy use. One of the primary ways to control and reduce energy consumption is through quarterly maintenance and tune-ups. Unfortunately, the byproduct of this service is the increased waste created by air filters. Air filters are comprised of filter media, cardboard, and metal – and while each of these elements typically have their own recycling streams – it isn’t easy to separate these components in a cost-effective manner. At Reitmeier we want to lead the way and create the right solution in everything we do. Through strategic partnerships with local, like-minded companies, we have solved our filter waste challenge. With our new system in place, zero percent of our clients’ filters end up in a landfill or in their on-site dumpster. Instead, our clients’ air filters are collected in a central location, picked up by a partner company, and shipped to an Energy-from-Waste (EfW) facility located just south of Salem, Oregon. This federally-regulated site burns bulk waste, and in turn, produces high-pressure steam. This steam is then used to power a turbine generator – ultimately sending power back to the grid. The best part? At Reitmeier, it doesn’t cost our clients any additional dollars to prevent air filters from becoming waste – and to have a positive impact on the environment. Last year alone, Reitmeier purchased and recycled 16,335 commercial air filters (typically measured at 20”x 25” x 2”) – this equates to 9,455 cubic feet of volume. In terms of volume, this also equates to 70,713 gallons of milk! These statistics show that a concentrated effort can have big payoffs for our planet – and can help to set a feasible standard for our industry as a whole. 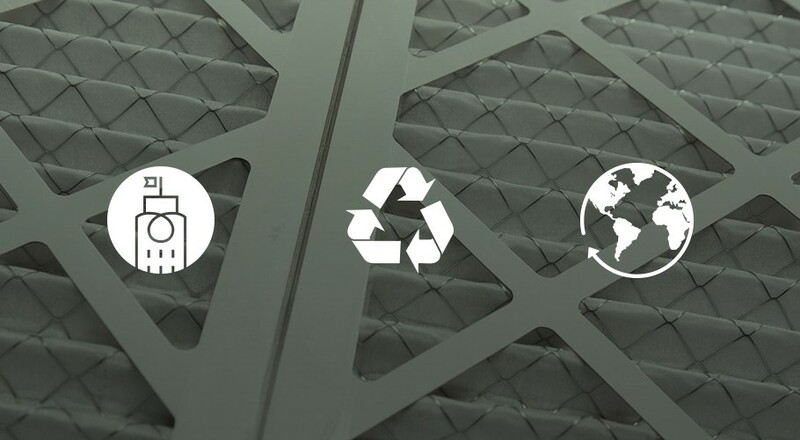 In truth, it doesn’t take an enormous effort to recycle air filters – it takes some research, willingness to reach out to strategic partners, and a commitment to putting new systems in place. At Reitmeier, we believe the balance between what we consume and what we conserve could very well determine our children’s future. To us, we cannot think of a more compelling motivation for achieving our goal of zero waste. Through strategic partnerships, creative thinking, and a bit of extra effort, we have solved our filter waste challenge! We’re grateful to our clients and partners for helping us to create a healthier world for generations to come. Want to learn more about how Reitmeier leads the way through our air filter recycling? Contact us or call us today at 503-603-0205.